ScienceDaily (Dec. 18, 2010) — Wind turbines in Midwestern farm fields may be doing more than churning out electricity. The giant turbine blades that generate renewable energy might also help corn and soybean crops stay cooler and dryer, help them fend off fungal infestations and improve their ability to extract growth-enhancing carbon dioxide [CO2] from the air and soil. Speaking at the annual meeting of the American Geophysical Union, a scientific society, in San Francisco December 16, a researcher at the U.S. Department of Energy's Ames Laboratory and his co-researcher from the University of Colorado announced the preliminary findings of a months-long research program aimed at studying how wind turbines on farmlands interact with surrounding crops. "We've finished the first phase of our research, and we're confident that wind turbines do produce measureable effects on the microclimate near crops," said Ames Laboratory associate and agricultural meteorology expert Gene Takle. According to Takle, who is also a professor of agricultural meteorology and director of the Climate Science Program at Iowa State University, the slow-moving turbine blades that have become a familiar sight along Midwestern highways, channel air downwards, in effect bathing the crops below via the increased airflow they create. His colleague in the research is Julie Lundquist, assistant professor, Department of Atmospheric and Oceanic Sciences, at the University of Colorado at Boulder, joint appointee at the U.S. Department of Energy's National Renewable Energy Laboratory, and Fellow of the Renewable and Sustainable Energy Institute. Lundquist's team uses a specialized laser known as a lidar to measure winds and turbulence from near the Earth's surface to well above the top tip of a turbine blade. "Our laser instrument could detect a beautiful plume of increased turbulence that persisted even a quarter-mile downwind of a turbine," Lundquist said. Both Takle and Lundquist stressed that their early findings have yet to definitively establish whether or not wind turbines are in fact beneficial to the health and yield potential of soybeans and corn planted nearby. However, their finding that the turbines increase airflow over surrounding crops, suggests this is a realistic possibility. "The turbulence resulting from wind turbines may speed up natural exchange processes between crop plants and the lower atmosphere," Takle said. For instance, crops warm up when the sun shines on them, and some of that heat is given off to the atmosphere. Extra air turbulence likely speeds up this heat exchange, so crops stay slightly cooler during hot days. On cold nights, turbulence stirs the lower atmosphere and keeps nighttime temperatures around the crops warmer. "In this case, we anticipate turbines' effects are good in the spring and fall because they would keep the crop a little warmer and help prevent a frost," said Takle. "Wind turbines could possibly ward off early fall frosts and extend the growing season." Other benefits of wind turbines could result from their effects on crop moisture levels. Extra turbulence may help dry the dew that settles on plants beginning in late afternoon, minimizing the amount of time fungi and toxins can grow on plant leaves. Additionally, drier crops at harvest help farmers reduce the cost of artificially drying corn or soybeans. Another potential benefit to crops is that increased airflows could enable corn and soybean plants to more readily extract atmospheric CO2, a needed "fuel" for crops. The extra turbulence might also pump extra CO2 from the soil. Both results could facilitate the crops ability to perform photosynthesis. Takle's wind turbine predictions are based on years of research on so-called agricultural shelter belts, which are the rows of trees in a field, designed to slow high-speed natural winds. 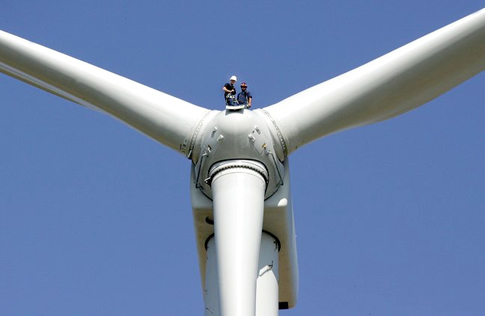 "In a simplistic sense, a wind turbine is nothing more than a tall tree with a well-pruned stem. For a starting point for this research, we adapted a computational fluid model that we use to understand trees," said Takle. 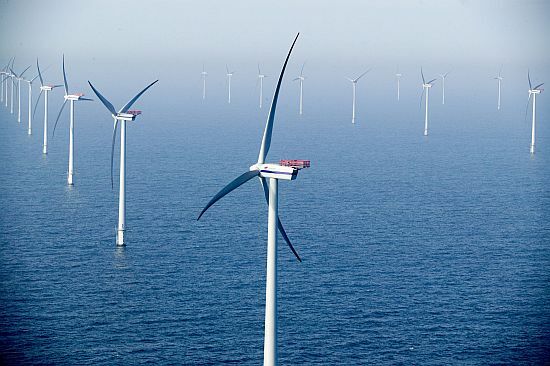 "But we plan to develop a new model specific to wind turbines as we gather more data." 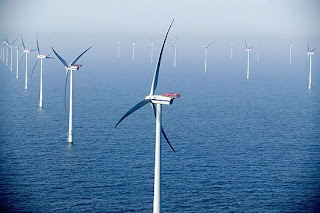 The team's initial measurements consisted of visual observations of wind turbulence upwind and downwind of the turbines. The team also used wind-measuring instruments called anemometers to determine the intensity of the turbulence. The bulk of the wind-turbulence measurements and the crop-moisture, temperature and CO2 measurements took place in the spring of 2010. "We anticipate the impact of wind turbines to be subtle. But in certain years and under certain circumstances the effects could be significant," said Takle. "When you think about a summer with a string of 105-degree days, extra wind turbulence from wind turbines might be helpful. If turbines can bring the temperature down below 100 degrees that could be a big help for crops." The Ames Laboratory's royalty income seed funding program supported the initial work. Additional funding came from the DOE's Office of Energy Efficiency and Renewable Energy. 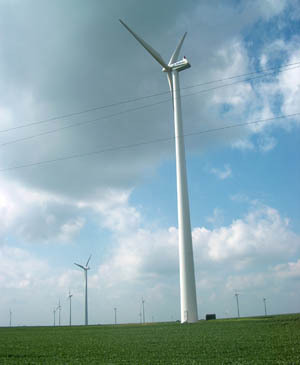 The U.S. National Laboratory for Agriculture and the Environment contributed the surface flux instruments used to measure the wind turbines' effects and the personnel to operate them. Ames Laboratory is a U.S. Department of Energy Office of Science research facility operated by Iowa State University. Ames Laboratory creates innovative materials, technologies and energy solutions. We use our expertise, unique capabilities and interdisciplinary collaborations to solve global challenges. Really thanks for taking time to leave a comment..